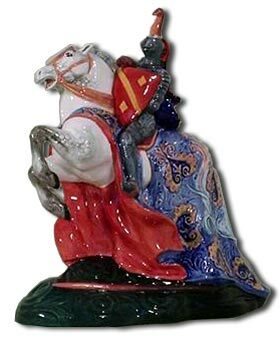 Peggy Davies was one of Royal Doulton’s most highly regarded figure modellers. Margaret (Peggy) Davies was born in Burslem only a stones throw from the Royal Doulton Burslem works. She suffered from tuberculosis which she contracted when she was a young girl and was forced to spend much of her young life in hospitals. As a result she fell behind with her schoolwork but luckily a teacher spotted her artistic talent and was happy to let her concentrate on this instead of her more academic studies. The 1920s were a hard decade and Peggy Davies was sent to live with her grandparents as they were better able to cope with her special needs. Her grandfather was a working engineer in a local potbank and lived in a large house attached to the works. At the age twelve Peggy won a scholarship to the Burslem College of Art and she studied full time for several years under the tutolage of Gordon Forsyth. Family circumstances forced her to seek employment before her course ended and she found a part time assistants position with a local ceramic designer called Clarice Cliff. In 1939, she took a position with Royal Doulton as assistant to Cecil Noke son of the renowned Charles Noke, and simultaneously set up a small workshop at home. The Second World War interrupted Peggy’s employment with Doulton when a bomb partly destroyed her home and she decided to join the war effort and become a nurse. After the war Peggy Davies returned to her first love, when she set up a new workshop at home. From here she worked freelance under contract to Royal Doulton and produced a long stream of new figure models for the Doulton HN series. In 1945, Peggy’s first model ‘HN1976 Easter Day‘ was released. A charming model of a young girl in a full length dress and bonnet tied with long ribbons. In 1947 she followed this with ‘HN1992 Christmas Morn‘. 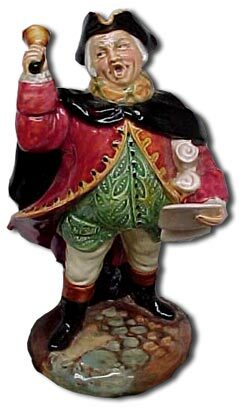 Peggy Davies went on to produce a superb series of eight figures portraying the Important Ladies in English History and numbered HN2005 to HN2012. She invested an enormous amount of time and work in making sure the various costumes were realistic and historically accurate. Although Peggy produced a seemingly endless flow of enchanting lady figures, child studies and character figures, her first love was for the larger more intricate pieces such as ‘HN2041 The Broken Lance‘ and ‘HN2051 St George‘. Both pieces were released before 1962. She then went on to produce other superb figures such as; HN2261 The Marriage of Art and Industry; HN2324 The Matador and the Bull, and HN2428 The Palio. Ever since her Royal Doulton career began her figurines have portrayed all periods of fashion from medieval to modern times. 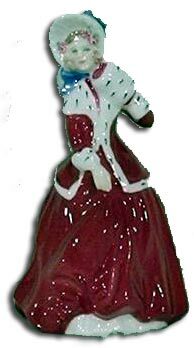 Among the best loved Peggy Davies figurines are Southern Belle, Christmas Morn, Ninette and Victoria. In addition to her artistic career, Peggy Davies was a devoted wife and mother and she brought up three sons who often posed for her child figures like the River Boy. Her husband and father also appear as characters in the Town Crier and The Master. After her retirement from Royal Doulton, Peggy kept working and took on new challenges. Producing a collection of character jugs commissioned by Pascoe and Company in 1987. In 1988, she made her only visit to the United States to meet collectors at the Royal Doulton show in Florida. Peggy Davies died in 1999 … sixty years after she started work with Royal Doulton. 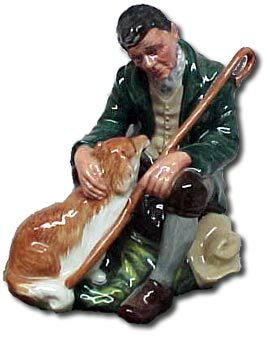 Peggy always strived for perfection in her work and not only the quantity but the quality as well as the popularity of her superb Royal Doulton figures testify to just how collectable she is.